After years of looking at her crooked front teeth, Shelly decided it was time, and she got braces on her teeth again. Last time was Jr. High! This time it was 10 January 2009. She was actually quite happy with the pain of her teeth moving as she needed to lose some weight anyway. Only able to eat smoothies for a couple of weeks, and again each time during the year they were tightened, she was able to get rid of the extra pounds she had gained in 2008. Shelly continues to work at the yacht sales business in La Paz. February is Carnival and it is a big celebration here. Parades, rides, loud music nightly and lots of junk food! Thank god it is only a week. 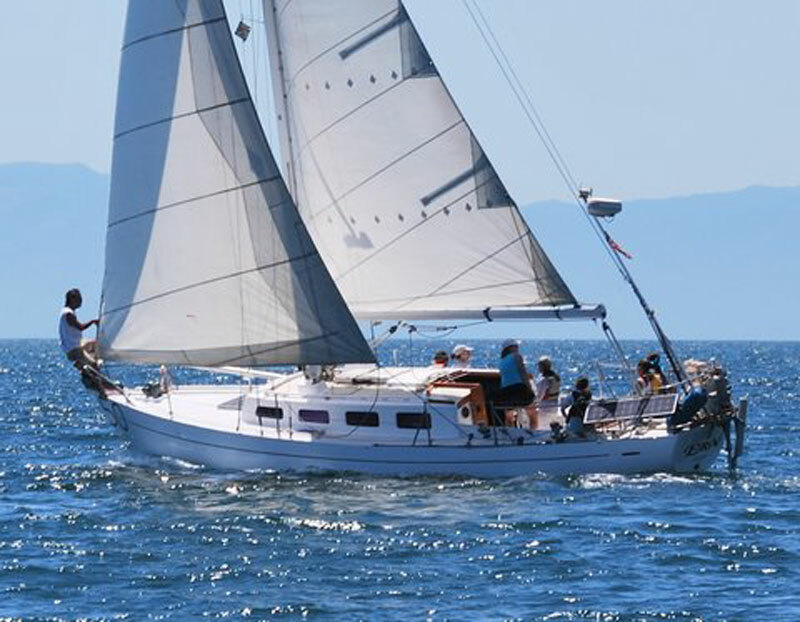 In March for spring vacation, we sailed EROS to Puerto Vallarta for the Bandaras Bay Regatta. The night we arrived at the new La Cruz marina they were shooting off fireworks, what a welcome! Turns out there was a boat show downtown, but they were having a VIPs party at our marina! We were given passes to the boat show from our friend Rafael, the marina manager, where we met Octovio the famous bronze statue maker. His work is located worldwide, but well known for the whales at the entrance of PV marina. The next day he gave us a tour of his foundry and showed us how he made these fascinating marine life sculptures, both huge and miniature models. We bought one of a momma whale pushing up her baby to the surface for his "First Breath", the name of the piece. It looks lovely in my office! For the Bandaras Bay Regatta we signed on the kids from the VYC Jr. Sailing team, many of whom I had coached back in 2007. 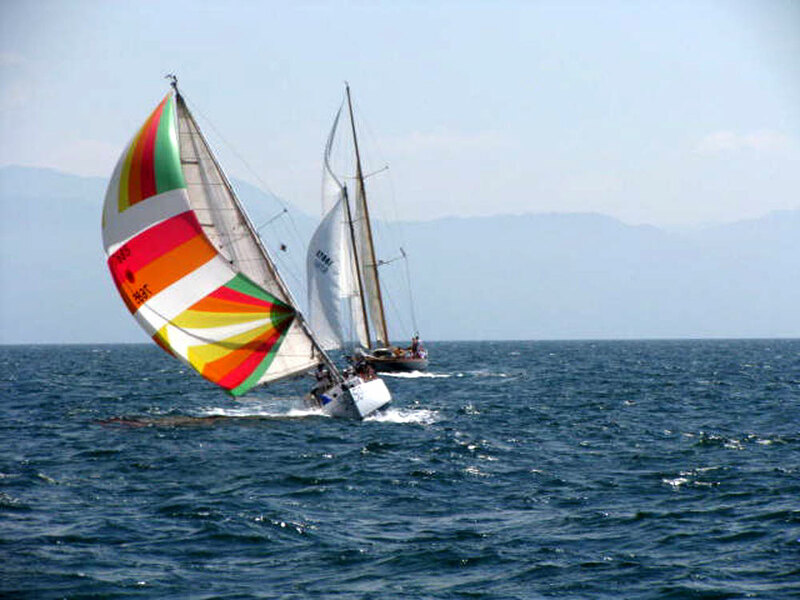 They did great including flying the spinnaker and took turns at the helm and pulling on the lines. These kids are so good, we won our class hands down and all got big trophies! Everyone had a great time including the Moms. On the way back to La Paz, we stopped in to visit our friends in Mazatlan, the Rodriguez Family, Shelly's bosses Ray and Jeannette and other long lost cruising friends. In April we flew up to the San Carlos/Guaymas area on the mainland to look at some of Shelly's listings, one of which we were considering for ourselves, a Peterson 44. In May, Jody delivered a Catalina 400 North to San Diego. He and the guys had a good trip up the coast, while Shelly stayed behind to continue the yacht sales. Jody flew back east from San Diego to TN and VA where he visited Sister Maureen and picked up Grandma's car she had left us (a 4w drive for the Baja!). On June 15th, we came to an agreement on the new boat and purchased AVATAR (then called Livin'). So Jody drove cross country back to San Carlos to start work on the boat in July. He stopped to visit his old friend Leonard in New Mexico on the way. Meanwhile, Shelly was doing a seatrial in Mazatlan when tropical storm One E formed and slammed into the marina without much warning. 70 knot winds broke some dock lines and ripped some canvas, but luckily no real damage, quite exciting though to say the least! For 4th of July weekend, Shelly got her friend Sheila to crew for her out to the islands for a little well deserved sailing R&R. We had good winds for sailing and got in a couple snorkels and a scuba dive at Los Islotes with the sea lions. While anchored in a small cove on Isla Partida, we saw Capt. Robbie, a friend who I had taught sailing with in PV. Sailing makes the world seem quite small! In the end of July, Jody had to drive back to San Diego to help his friend Jack and get some boat parts. So Shelly flew up to meet him and go on a SW tour for the month of August to celebrate being together again. 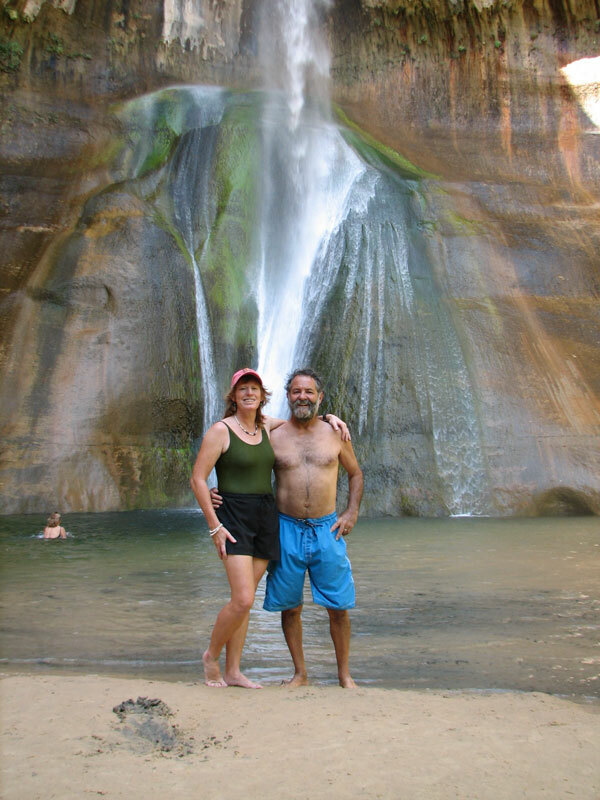 We camped at all the well known places, Zion, Bryce, Escalante and then drove down the water pocket fold in Capital Reef NP for Jody's birthday. It is amazing that there are still a few places in the USA, you can really get away from civilization. We camped by Lake Powell and took the ferry across the Colorado River. We camped again in our favorite spot, Valley of the Gods in Utah and drove a dirt road along the Comb ridge, where we hiked to some Anastazi ruins. We continued around the La Sal Mountains and down Castel Valley and camped again by the Colorado River. Then we high tailed it to Avon Colorado to check into a condo. Cousin Katie came up from Denver and visited us for the day. We took a tour of Leadville, an old Silver mining town high in the Rocky Mtns. Jody and I soared on bicycles from the top of the Continental Divide down to Vail and all the way back to Avon, as we played tourists. The free Gondola ride to the top of Vail mtn made for a spectacular view and a good music concert. Once we checked out of the condo we drove to our property in Hartsel Springs. Finally we spent our first night on our own dirt! Our neighbor found out we were sleeping in a tent and offered us her gun for protection from the mountain lions and bears! Oops silly sailors camping in the mountains did not know better. Never did see either! We hiked all over our 12 acres, marked it with our hand held GPS and picked out a spot to build a cabin some day. What a view of the Collegiate Peaks from there! It started raining on our tent program so we went to town for Buffalo Burgers and hot chocolate then drove on to our friends Ward and Julia's ranch in Montrose. They took us for a horseback ride and let us sleep in the barn (the horses sleep outside). We headed East from there on a dirt road back to Utah. We stopped in Bedrock to look for Fred and Wilma but apparently they have moved. Camped at a secluded spot near a creek the gal in the general store told us about. More remote America!! To celebrate our 14th wedding anniversary, (which was back in July) Jody took me to a 5 star resort condo in Sedona, AZ. It is such a special place with the jutting Red Rocks, crystals and high energy. Too bad it is so exploited now from the years ago when we were there, but I did enjoy the pools, and Jacuzzi. Oh well, have to take the good with the bad. (what bad??) We went on several hikes, swam in the creek and window shopped at some fancy stores and art galleries. Back in San Diego we returned the folding picnic table to Sheri (what a great addition to our camping equipment!) We were just in time for the Labor day weekend raft up in Shelter Cove. One of her neighbors brought a huge inflatable iceberg. All the kids (and adult kids!) were swimming out to climb to the top, just to slide or jump back into the water. It made for great entertainment for everyone in the anchorage. After going on a boat part buying spree, we hurried back to La Paz to see how bad the destruction was from Hurricane Jimeana. The road was not as bad as we had heard, but there were workers everywhere putting up electric poles and repairing the bridges. This storm luckily missed La Paz, but clobbered San Carlos. Our friend Capt. Robbie hiked up the washed out road to check our new boat. It was standing there with bushes and debris wedged under her jack stands and keel. San Carlos received 28 inches of rain in 24 hours and 3 feet of mud had pushed its way through the dry storage area!! The boat right behind us, a 53 foot ketch, was lying on her side, but thank god did not hit our AVATAR. They bulldozed between all the isles and had 30 guys with shovels hand digging out all the boats and replacing their fence. September 19th was EROS's 50th birthday, so we threw her a dock party. We had a big chocolate cake after the rain storm which cooled us from the 100+ degree weather and God gave her a rainbow. It was a great turn out and no one complained about the rain! It was kind of fun having all the people try to cram below to get out of the deluge. In October, yacht sales started getting busy again and we have been nonstop since. (YEA!) Jody finally was let back in the yard in San Carlos the first weekend of November and he took the car over on the ferry to Topolobambo and drove up the mainland. Nov. 25th the Braces came OFF! Strait white teeth! I had another business trip to the mainland right after Thanksgiving and finally caught up with Jody again. Captain Robbie called us in a big pickle, asking us to crew for him up the Pacific from Huatulco (south coast of Mexico by gulf of Tehuantepec) back up to San Carlos. It was a 1200 mile trip. The temperature down at 15 degrees latitude is quite nice, the water was super clear and a brilliant color blue. For the first four days we were playing turtle dodge there were so many and the dolphins gave us a grand show at sunset, riding our bow wake. We stopped in Las Hadas near Manzanillo. It is a lovely resort and beach made famous in the movie "10". This time of year, Orion rises just after sunset and sets right about sunrise. Night watches are divided into 3 hours stints. During this time, you are left alone in your thoughts and the vast expanse of the Universe shining above you. In the darkness of a New Moon night, on the barrens of the ocean, there are more stars in the sky than you ever imagined possible. On this particular night watch, I counted 36 shooting stars. It was Zen and there that I remembered how lucky I am to be given such an awesome life on this spectacular planet. We motored on, all the way to Mazatlan, were the fuel dock was closed because it was a Sunday. So we got to visit our cruising friends Kim and Linda who drove us to the barrio to see our Mexican family the Rodriguez for tacos. It was back to sea the next morning after the fill up of diesel. Just North of Mazatlan we crossed over the Tropic of Cancer. It feels like a line drawn in the ocean that says, "warm to the south and cold to the north". We added layers of clothes! We saw several whales jumping and enjoying the Sea of Cortez. We pound our way into head seas with the North wind now blowing. As the bow throws up a big spray, I can see a rainbow form as the sun hits the water just right. It as if to say, "don't worry, you are being watched over". The boat was learching and bouncing around making it hard to even go to the bathroom. We toughed it out and made it to 27 degrees N at San Carlos on the 18th of December! Mission accomplished! We got to visit with Robbie's family and play with the kids on the beach. Christmas was here before we knew it and Shelly had to get back to work to cover the office for her business partner Mike who is off to Eureka to visit his family for the holidays. We moved EROS over to the Christmas dinner raft up with Sheila and Audrey on Timeless and John on Mariah. It was 12 for dinner and a nice pleasant evening with friends and family. EROS is now back on her mooring, life is good . Hope your show went well. I looked at your photos on your web site and some of them are phenominal. Congratualtions. I am not as good of a photographer as you and it is always hard to photograph yacht interiors. I have 2 sets coming to you via email. The dinette will have to be done later as it is piled up with the mainsail which is removed while we are away from the boat for a month. Please post these and the others on our for sale page. Thanks for all your great work on this web page. PS I am working on getting a half hull made, I will keep you posted if any one else wants to order one. Wait until I get mine and I will let you know who and how much. A freind is arranging for it for me. Please find below the details of what we have done to Eros in our 17 years of custodianship. It has been an honor to love and care for this Greek god of love. Also attached is a photo from the summer of 2005 in full cruising mode. If they want a current photo see her in race mode from the story of the 2009 Bandaras Bay Regatta. We are asking $55,000. We probably have almost twice that into her. We bought Eros June 1st 1992. Since then we have basically restored her. She was sailed around the world by the previous owners and had been neglected for a few years when we got her. In 1994 we removed the interior and engine and laminated in all new ash sister frames from the forward bulkhead aft of the Vee berth to the bulkhead aft of the engine. Some of the floor timbers were also replaced and all of the frames that were sistered had a partial floor timber built over and glued and fastened to the original. The timber at the mast bulkhead was sistered. The transom was removed and replaced with a new laminated wood one and glassed over. She has a new corrian counter top. A newly insulated custom built engine driven freezer and refrigerator and a new ss 2 burner Regal stove with oven. In 1999 a new electrical 12volt dc /120volt ac new wiring. (old system removed) (all new wires) The interior was rebuilt to original layout with a chart table on the port side fwd end of quarter berth the reaming portion is tool and spare parts storage. New paint and varnish throughout. October2003 we replaced the mast and boom with a custom made aluminum Fore spar mast and boom version from the original specs. I will have to say the boat sails unbelievably better with less weight aloft! Both of us were shocked at the improvement. She has modern in boom reefing system a new main with triple hand sewn extra heavy duty reef points and all new ss rigging and new bronze turnbuckles. The backstay was moved outboard and built of stainless. A Shafer roller furler with a foam luffed miter cut vary heavy cloth 120 jenny makes it really sweet and safe for offshore cruising. In vary heavy conditions we roll her in to the right size and keep on going without leaving the safety of our dodger and Biminis protected cockpit. The 2 large self tailing winches and main traveler system make it easy for single handed sailing. The secondary winches make it easy to roll up the jib in extreme conditions. In 2008 the chain plate bolts were all replaced. She is equipped with a bronze manual windless for retrieving her 33lb Bruce anchor with 100ft of 3/8"BBB chain and 250ft of heavy duty Sampson braided line. 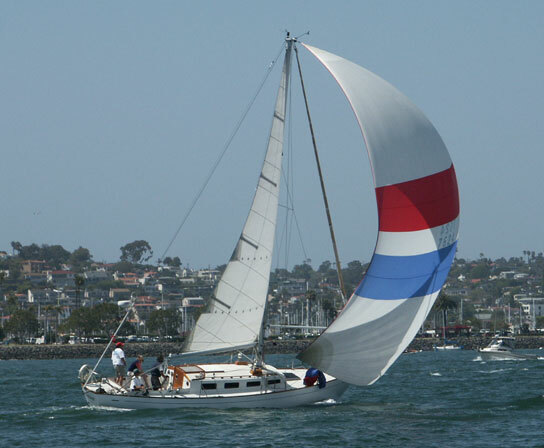 Her hull is so fair she is often mistaken for her newer fiberglass version the famous "Cal 36". 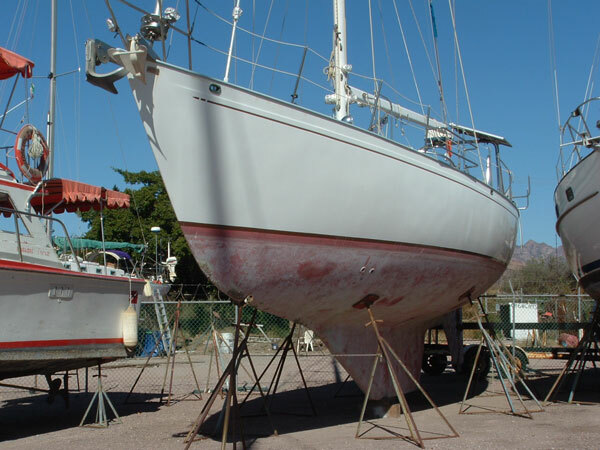 In 2008 the bottom was bared and dried in the Baja sun Smith penetrating epoxy was applied and faired with cavasil thickened epoxy, barrier coated and painted with 3 coats of hard antifouling and a coat of soft for ease of cleaning the bottom. I'm extremely happy with the results of this painstaking process. She is sailing nicely in light airs and winning races here in Mexico. We have a perpetual trophy in the PV Yacht and many trophies from Mexico and California. I must say that I truly am having a hard time with the thought of selling her. One redeeming thought is that she is now vary strong safe vessel well equipped with a new in 2005 Vetus 25hp diesel engine with a full compliment of spares. Gps Wind speed Depth sounder Speedo Water temp VHF Stereo 10 disc CD Changer etc, etc. She will make the lucky new owners very happy to be sporting about in one of William Lapworth finest designs. And I'm proud to have been her caretaker. 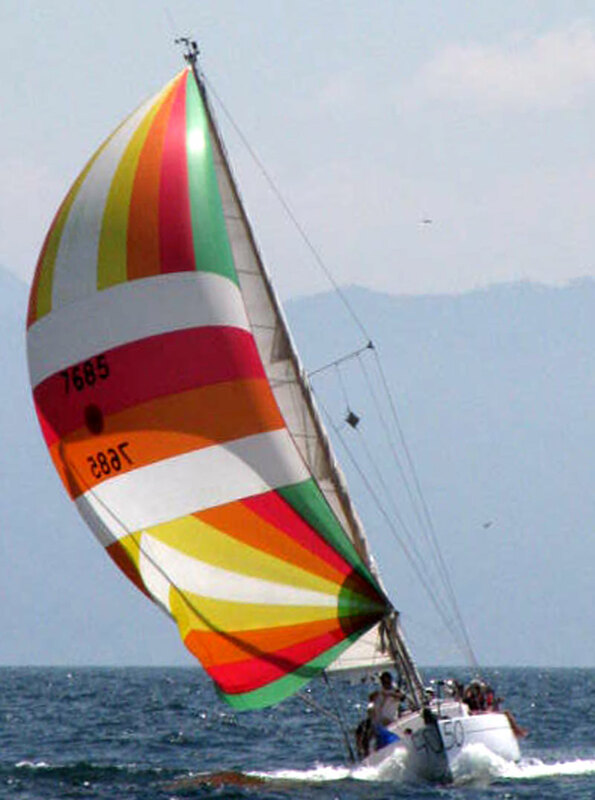 Bandaras Bay Regatta is a fun cruisers 3 day regatta held every March, sponsored by the Vallarta Yacht Club. Eros, now home based out of La Paz, Baja Mexico, made the 300 mile sail over just for the race. We had the VYC Jr sailing team crewing for us, 10 to 15 year olds. Each race we had a different helmsperson, but everyone learned all the different positions including rail meat technician. The crew was 10 year old Adrian and his brother Juan Grande (small guy with a big heart), twin sisters Andy and Chris, sisters Melisa and Natasha all 12, and Nora 15. Saturday we also had our friend Pedro from La Paz and the boys Mom Ana with us. The first race on Thurs March 18th Juan was at the helm and we nailed the start. The wind piped up over 20 so we reefed the main and she stood up and marched to weather at 6.5 to 7 knots. First around both the weather and jibe marks, we headed for the finish line wing on wing, deciding it was a bit much for flying the spinaker with just us and the kids. Friday was the long distance race with Chris at the helm. We saw 8's on the reaching leg. With the competition close behind and having to give them all time, we decided to pop the chute and left them all in our wake. With 15 to 18 knots of wind it was an L36 kind of day! The last race saw Andy at the helm. Over early at the start we had to duck the line, which sent us in the opposite direction of the rest of our fleet. Wind over 20 we reefed the main and she again flew up wind. With a wind shift in our favor we ended up in the middle of class 4 which started 5 minutes earlier (we were in class 5) and toasted our competition. At the jibe mark with 17 knots of wind and a few extra adults aboard, we decided it was time to pop the chute again and we zoomed to the finish ahead of the Schooner Rose of Sharon(see photo), a class 4 boat. With cheers all around the crew threw each other in the water back at the marina in celebration. You gotta love sailing with kids! All of them practice regularly in Optimists at the VYC. The 5 girls are currently off at the South American Opti Championships in Equidor. Go girls! We would like to thank Steve Sommer of Sea Biscuit for the photos. Hi we are back in La Paz after spending most of last year in Vallarta. We came here for a haul out but have ended up doing part 2 of our restoration. Many years ago before we left San Diego we sistered most of the middle and quarter berth areas of the boat. Now we are getting ready to sister under the vberth. Some bad news I found out since I got here is that Flur de Mer is no longer. Apparently she sank again in one of this summer's hurricanes and was raised, but sank again. I heard she was then raised onto a barge and disposed of. Sad story. There is also another L36 in the marina Palmira boatyard which has been there on the dry since we arrived in Mexico in 03. It is in a very sad state as you can imagine. Please give our best to Bob on Eventide. I will send photos and story of part two of our rebuild. Eros is hull #40 and was circumnavigated by the previous owners as Gamit. Thanks for doing such a great job with this web site!